Fate of the Jedi started out as decent story….the introduction of Vestara Kai and the Lost Tribe of the Sith to the Star Wars cannon are both worthy additions. That said, this last book was such a total piece of sh*t it makes us sick. How this book ever got through editorial oversight is beyond us. This book could have been 200 pages shorter and it would have been much better, delivering the key plot points. 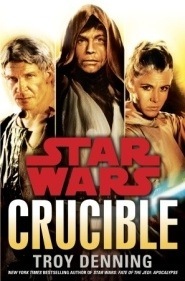 As it was, this was easily the most painful Star Wars book we’ve read in years. Long, slow drawn out action. Sure action is great to have, this whole book is action and most of it makes no sense at all. Were this not the last book in a series we’ve read from the beginning, there is no way we would have read this to the end, it’s that bad. At the beginning of this series Luke leaves Coruscant, then he comes back. Then the Jedi leave, then they come back, Then they all leave again. And in between Abeloth is destroyed and Jaina get married to Fel. And oh yeah Vestara — is she good or evil? who knows…the author of this book totally buthered her character so much so that we just don’t care. Yes we love Star Wars books, and yes we’ll still buy the next series that comes out — even though at this point it’s clear that the publisher is just abusing readers. As is often the case lately with Star Wars series – each installment has a few interesting development and plots and sub-plots but aren’t standalone stories. In Abyss, we finally see the Kesh Sith confront the Skywalkers – which was the best part (and the finale) of the book. The return of the Sith – not Darth Bane’s Sith – but the True Sith that number in the hundreds (thousands?) is perhaps the best underlying plotline in the Fate of the Jedi series. The subplot of the going ons in Coruscant with Daala is relatively week and she’s not well written in this particular story. Author Troy Denning is best with the Skywalkers and the Sith and that’s where this story excels. Yes, this is another example of a long drawn out story – but for fans (like us) it’s one that you just don’t want to miss.